A Composr addon is simply a set of new files that together achieve some goal. However, at the end of the day addon-making is in the hands of users – while we can empower, we cannot write all the actual addons ourselves unless we can cover our costs. 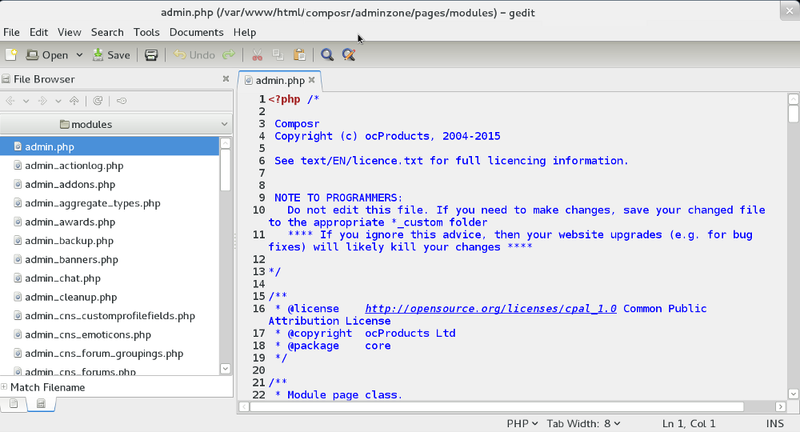 Therefore users who need addons need to 'carry the torch', promoting and being active in the Composr community. The more everyone puts in, the more everyone gets out – Composr users together are stronger than just the core developers are. The 'Making an addon' series of tutorials are highly technical, intended for those who already know PHP programming and the basics of Composr's modularity. You can always go to web to search and learn it. If you have any questions or want to discuss solutions, we've created forums on the http://compo.sr website for each tutorial in this series. Please ask questions there, even if they seem basic. Personally I develop Composr on my own computer under Windows. I have a PHP webserver setup and I manipulate files directly on my hard disk. I have caching disabled on my Composr install so that I don't have to mess around decaching when I change files directly. One of the most handy things about developing on the desktop is to be able to quickly run file contents searches in Windows to find out where stuff is done. Unfortunately though, by default Windows will not search inside most non-Microsoft file types unless you do some special set up. 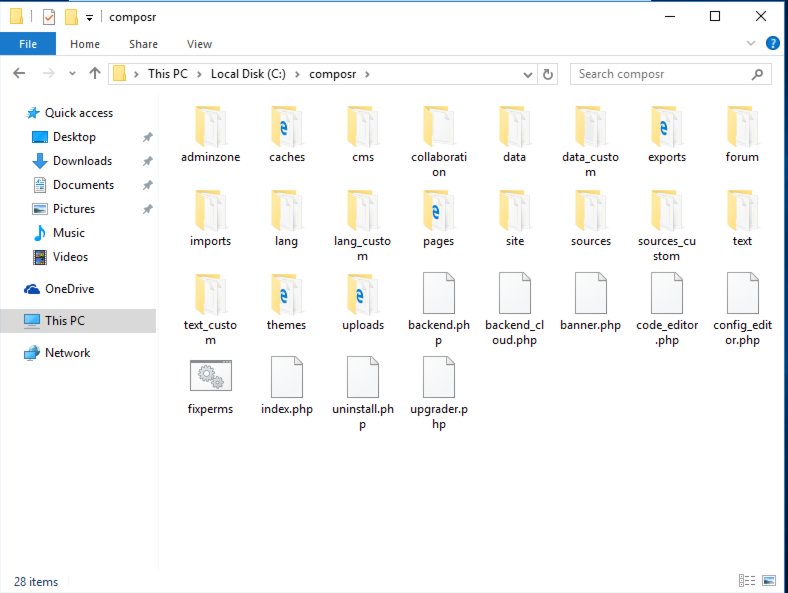 Here is a guide to what to do to fix this – use the technique for the ".php", ".css" and ".tpl" file types. Once this is done you'll be able to quickly find things by opening up an Explorer window and hitting F3. Alternatively, you can use an alternate search tool such as Agent Ransack, or an IDE that has a good "find in files" feature. Composr might seem a bit daunting with its (approximately) 4,000 files, but remember they are just files, and you don't need to understand everything to make changes – you only need an understanding of the core stuff, and the stuff your changes interact with. If you take backups of a file, you can restore that file to a prior state just by restoring your backup. If you add a file and it breaks things, you can delete it if you really need to. A very simple countdown block – but it'd be easy to style it and put it to work on useful tasks! We're going to be making a new Composr block that does 'counting down' or 'counting up' to a date/time given as a parameter to that block. Knowledge of PHP basics is required. Since we are going to make a block, we'll quickly go over the fundamentals of what blocks do in Composr. Coding method: A simple mini-block (without using template or language file). At the end of each of the tutorial in this series I will be releasing some exercises out. If you complete them, or have trouble completing them, post about it in the Developing forum. Make a block that acts as a good old-style hit counter. To do this you'll probably want to use the get_value and set_value functions. I'm not going to tell you where they are because you can find them yourself by doing a file search for function get_value( – once you do, you can view the actual source code for the functions in your text editor. Make a block that detects if the current logged in member has ever posted on the forum. If they have, don't do any output, but if they haven't output a suggestion that they make a post. The second is more adventurous and help you get used to using the database, which is always helpful. 1 point will be automatically given to anybody who posts on the forum because you get a point for each forum post anyway . Please do use the forum!